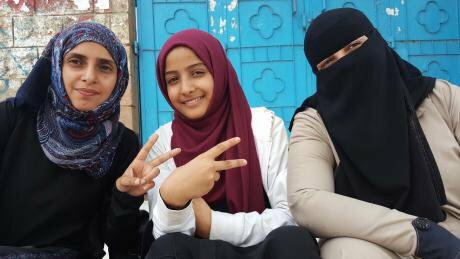 Human rights activist Reham Al-Bader (left), Elaf Samir Noman (middle), and Naseem Al-Faqeeh (right) taking a break during the distribution of food baskets in Taiz, Yemen in October 2016. Photo: courtesy of Hobi Laha Humanitarian Organization. All rights reserved.On 8 February, human rights activist Reham Al-Bader Al-Dhubhani and her colleague Mu'men Saeed Hammoud Salem were killed while delivering humanitarian aid in Taiz, a city in southwest Yemen which has experienced some of the most intense fighting since the ongoing conflict escalated in 2015. The war in Yemen has extracted grave tolls on civilian life. According to United Nations figures, 16,200 people have been killed including 10,000 civilians, and more than 3.4 million have been displaced. The country’s infrastructure, health, and education systems have been decimated. A million people contracted cholera in the world’s largest outbreak of the disease. Land and sea blockades of commercial goods including some humanitarian aid have compounded the crisis, pushing a country that has suffered from debilitating poverty to the brink of famine. Yemen faces what many have described as the ‘worst humanitarian crisis in the world,’ with more than 22 million people in need of life-saving assistance. Yemen had ranked last in the Global Gender Gap Index and the Gender Inequality Index before the escalation of the conflict, which has exacerbated structural inequalities. Rates of women suffering from malnutrition, as well as cases of violence against women, and child marriage, have increased. Yemeni women made significant strides towards political inclusion in the 2013 National Dialogue Conference, but their participation has been subsequently sidelined and only a handful of Yemeni women were engaged in the now stalled peace process. A soldier helps Reham Al-Bader and Naseem Al-Faqeeh to avoid snipers and landmines to distribute water and food to trapped families in Taiz, May 2017. Photo: courtesy of Hobi Laha Humanitarian Organization. All rights reserved.This is the extraordinarily challenging context in which Reham worked, among many other women who have stepped up to deliver much-needed humanitarian assistance and to broker resolutions to various manifestations of the conflict. Women are coordinating relief services – opening schools and medical units; delivering food and medical assistance; documenting human rights abuses; leading protests for the release of ‘disappeared’ loved ones – surmounting physical and metaphorical mountains to assist those affected by the war. Yemeni women are also leading and influencing efforts to support and reactivate local conflict resolution processes. In numerous governorates, women and women's initiatives have successfully resolved local disputes, contained violence, and steered communities away from armed conflict. In the process, women are exercising at times conflicting roles in conflict resolution – both playing upon gender norms and subverting them to mobilise community support, engage leaders, negotiate ceasefires, and assertively demand peace. Women's leadership in shoring up the stability of Yemeni communities threatened by conflict is not rare, isolated, or ‘new.’ But their efforts are insufficiently acknowledged and harnessed amid restrictions placed upon women and what is ‘appropriate’ for them to do. We must recognise the commitment and power of women to foster peace and stability in the face of the complex conflict and its humanitarian fallout, and bring about transformative change. 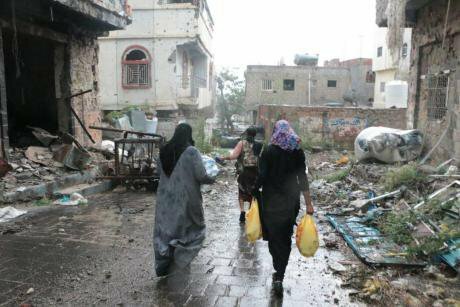 Across Yemen women are challenging the death and destruction around them, often paying a heavy price for doing so. Yet, their voices and skills continue to be marginalised and their engagement sidelined. The violence exacted on civilians and humanitarian partners in Yemen, which took the lives of Reham and her colleague, also plays a powerful role in silencing those who are actively striving to resolve the country’s multifaceted challenges. We must not permit that debate and dialogue are replaced with silence and fear. We demand that civilian lives be respected. And to all of us seeking a lasting solution to the conflict in Yemen, we must recognise and harness the expertise of all of those in society, looking beyond gender norms and stereotypes, to make our efforts truly inclusive.